Its grilling time again!! Perfect time to pulehu steaks or try this recipe made with miso butter. Order Hawaii's Best Salads, Sides & Soups - What meal would be complete with out a side dish to accompany the entree? 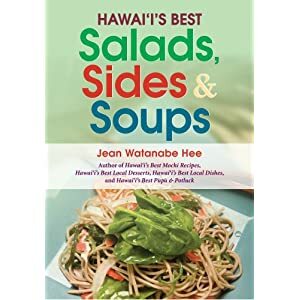 Take the guess work out of what to prepare with dinner with Hawaii's Best Salads, Sides & Soups, a collection of over 100 recipes for hearty and nutritious salads, savory soups and tasty side dishes. 1. In a small bowl, stir together butter, miso, chives, and garlic. Spoon butter mixture onto a square of plastic wrap, fold plastic over butter from the top and the bottom, and use your hands to form it into a log shape about 1 1/2 in. thick. Twist sides to close. Put in freezer for 30 minutes or until firm. 2. Meanwhile, rinse steaks, pat dry, and season well with salt and pepper; set aside at room temperature, 15 to 25 minutes. Peel onions and cut in half crosswise. Trim about 1/2 in. off rounded sides of each onion so halves lie flat. Rub onions with some olive oil and salt and pepper to taste. 3. Prepare a gas or charcoal grill for medium-high heat (you can hold your hand 1 to 2 in. above cooking grate for only 3 to 4 seconds). Grill onions 2 minutes, then add steaks and grill until nicely browned, 3 to 4 minutes. Turn everything over. Onions will need another 6 to 8 minutes, until they're softened and nicely browned. For steaks, cook an additional 2 to 4 minutes for rare, 5 to 7 minutes for medium-rare, and 8 to 15 minutes for well done (cut to check). 4. Top each steak with 2 tsp. miso butter (you will have some butter left over). Serve with onions and a simple green salad if you like.